This evening, I was in the mood for Eggplant Lasagna using slices of baked eggplant as the "noodles". I didn't need to cook last night because we had the Zucchini Spaghetti leftover from Saturday night's dinner and we've been eating the leftover pizza from Sunday night 's dinner for lunch the last couple of days. So...we are ready for a "new" dinner tonight! 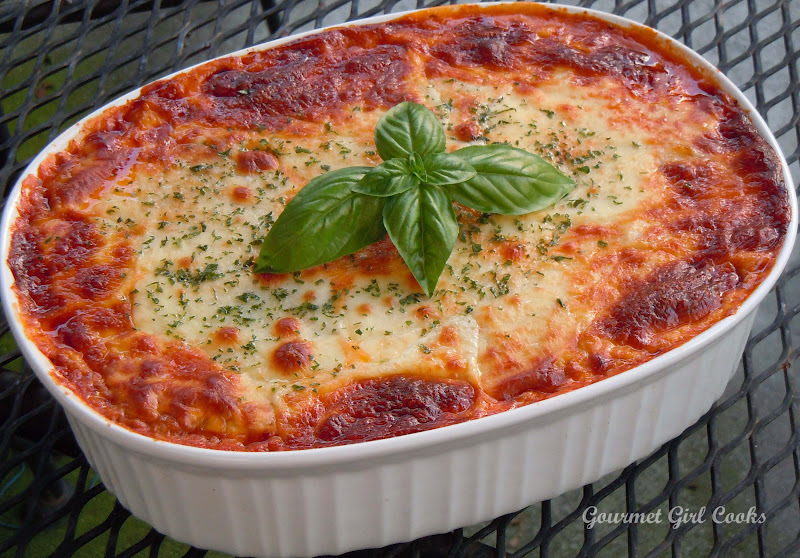 I've posted a couple pics of the Eggplant Lasagna below as well as the easy peasy recipe. Enjoy! In a medium saucepan or stockpot, brown the ground beef until cooked through. Pour jar of spaghettii sauce over beef and simmer 15-20 minutes, uncovered. On a couple of large cookie sheets (I lined with non-stick Reynolds foil), lightly brush the pans with olive oil and placed eggplant slices, brushing lightly with olive oil; season with salt and pepper and bake at 400 degrees for about 30 minutes (or until tender), turning eggplant over 1/2 way through. Lightly brush the bottom of a baking dish or casserole dish with olive oil; spread 1/2 cup of sauce in bottom of pan (more, if desired). Layer 1/2 of the eggplant slices, overlapping until bottom is covered. Spread about 1-1/2 cups of meat sauce over the eggplant base layer; spread ricotta or cottage cheese on top of the sauce layer; top with 1/2 the mozzarella and provolone. Add 2nd layer of eggplant using the remainder. Cover with more meat sauce; top with remaining mozzarella and provolone cheese. Bake at 375 degrees for approximately 25-30 minutes, until bubbly and browned on top. *Note: If you cut this lasagna too soon while it is still real hot (like I did), it won't cut into nice squares because all the cheese and sauce runs together. I made the same mistake when I made the Zucchini Lasagna I made recently...but the next day it cut beautifully after setting up. We just couldn't wait tonight so we rushed it a bit! Also, I think ricotta cheese would be better than using cottage cheese since cottage cheese doesn't really melt the same way that ricotta does. Yes, it's good to leave it sit before cutting. I usually let it sit 15-20 minutes. Hate to say it, but, to me, it always tastes better the next day. I've used either eggplant or zucchini to make a low-carb lasagna and they are both great.